TEAM CHARLOTTE > GOT 3 HONDAS! “People on Gold Wings can get a gallon of milk and it won’t even phase them,” I said to Caleb in a Piggly Wiggly supermarket in Richlands, NC as we shopped for our first batch of provisions, aware that we have virtually no space to put extra things. Our pals Jenkins and Foster ride upon the heated lounge chairs of that top touring choice of thousands, the Honda Gold Wing; 930 pounds of touring power, luxury comfort, and entertainment. 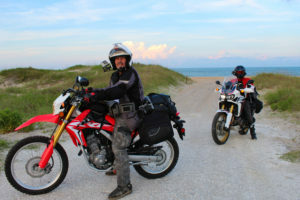 On our 2nd day out, it occurred to me that we were doing the same as they — motorcycle touring– through the muggy and greenly-beautiful (rain) forests and river-lands of North Carolina on the way to Cape Hatteras National Seashore. My mount, however, was a 318 lb. 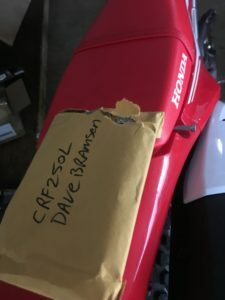 Honda CRF250, with a seat the size of a 2 x 6 and, in the absence of wind-blocking fairings, my open jacket was inflated like a parachute in the humid heat. 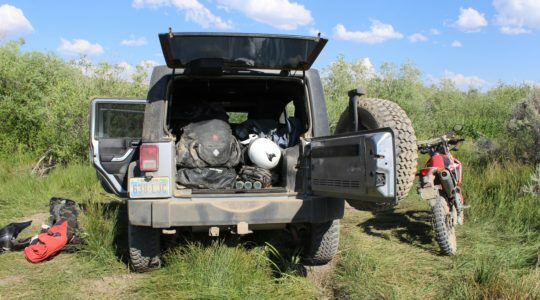 The bike WAS touring in Wing-mode as it was loaded with gear for 6 weeks of adventure. I had switched bikes with Maki to give him a taste of The Africa twin. So, yes, we were finally touring! June 3: we rolled out Saturday evening after 6 hours of setting up the 3 Hondas with 12v. 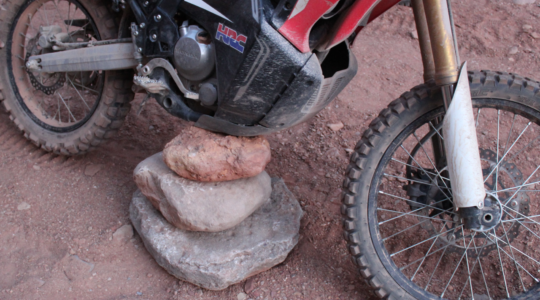 power outlets and devising ways to turn dual sport motorcycles into luggage carriers! Our point of pick up, Team Charlotte Motorsports, offers 500 bikes with an awesome side dish of vintage and classics > …Aerial Square! …CBX! …Mini-Trail! Raise your hand if that didn’t excite you. If it did, Greg Ulrick, check out Paul’s Photo Journal. 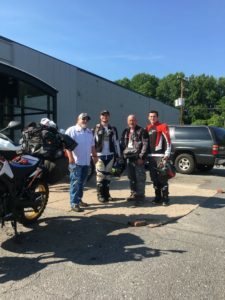 And the hospitality of Team Charlotte was excellent: from Mgr Rob Wiley who connected us with the bikes, to mechanic Jerry who helped with electrical bits, to Haley, host of helpfulness, including free popcorn and drinks. And a big thanks to California guys Kurt and Matthew at Motorcyclist Magazine and Tony at American Honda Motors for making this Honda thing happen. Our 3 steeds: > Africa-Twin CRF1000 and >> CRF250L and >>> CRF250L Rally are smooth machines with anticipated built-in Honda reliability. They both fall in the activity category of “Dual-Sport”: some asphalt, some dirt. But this is a diverse squad of equipment for the task at hand. The A-Twin is great on the road, with plenty of of good power and a 6th gear with a relaxed cruising mode (4000 rpm @ 68 mph). But it’s a bit bigger than what conventional wisdom suggests for the Trans-America Trail (TAT). My research generally indicated: “650cc max displacement size for the TAT”. The A-Twin is 998cc, weighing about 550 lbs. wet. And that’s before my pile of necessary crap is bungee/strapped to the beast. But this newly-released machine has rated highly among the big adventure bikes and will see a lot of road and trail with many riders. At the other hand of the spectrum we have a couple svelte 250s weighing under 350 lbs. wet. The Rally is tricked out with some extra fairing bits, a nice little windshield, and fancier hinged fuel cap for filling the ~.7 gal. larger fuel tank (don’t scoff, Ross and Greg with your juicy BMW 1200RT tanks. Seven tenths of a gallon can mean more than 40 extra miles.) The 250s have been doing 60-70 mpg so far. But these 250s are meant for a legal street ride to the backcountry and playing for the day in the rough with your lunch and water in a fanny pack. They were NOT designed with our specific purpose in mind: to ride across America with all your supplies on the back. There’s not a frame structure for it and they ain’t designed for saddlebags! (First day out, Maki chewed a hole through one with the rear tire. ) So, we are asking these machines to go the extra (5000) mile(s) and they are doing remarkably well. 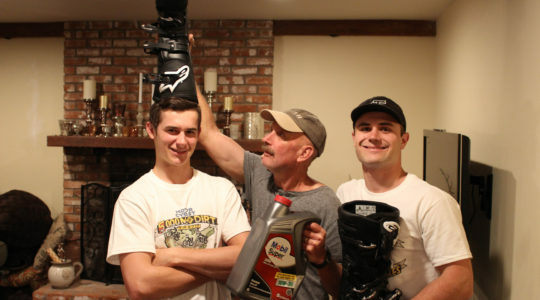 This is an adventure test for an old dad and young sons to test their mettle of endurance and teamwork. And for the machines: Two small bikes: better in the dirt; and one big bike: better on the road to > test their mettle — and metal — as well. >So much GREEN. It is NOT politically incorrect to have huge lawns. It is part of the bond of culture to mow mow mow. So much manicured grass. >AndRainforest! The woods are impenetrably thick. >In California Harley guys don’t wave to Dual-Sport riders. Out here they do. >So many fine explosive stands. Maki seeks BEES. A small buzzing firework thing. >At our blog headquarters — McDs — praise songs to Jesus play forth. We’re not in Santa Barbara any more. The 250s were put to the test. 115 miles after leaving Team Charlotte and then 320 miles the next day from our Airbnb in Sanford, NC to The Cape Hatteras National Seashore. They purred along at freeway speeds without a quibble, just like Bret’s Gold Wing does. Except the butts were a little worked. But, come on: these are 250’s. 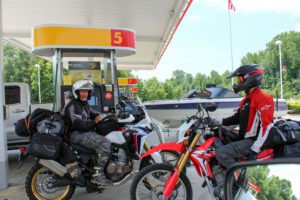 And, as I mentioned to Paul, how many will ever mention, “I rode across America on a 250.”? Anyone, my sister Lynette/whatever, can ride across America on a Gold Wing. As we approached the Cape, the last 50 miles were awesome. Lots of rivers, rainforest-thick woods, swamps, causeways over white-capped oceans, and tackle shop with large Tarpon on the wall. 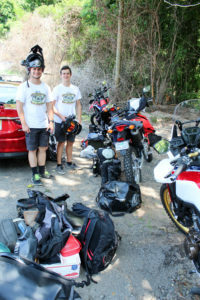 Previous Post Photo Journal 3 – We Got Bikes! My 6 year old twins and I were at McDonald’s in Richlands, NC when these guys came in and sat down beside of us. We started talking to them mainly because my son saw them ride up on their bikes and they had on their riding gear so naturally he had a lot of questions. Awesome young men! They patiently answered my son and daughters questions as we learned of their epic adventure. I was truly inspired by their quest and the fact their father was doing this with them. We wish you guys safe travel and God speed. Thanks for the update on the bikes. I have spent the past six months planning my trip and preparing my bike. Looks as if you guys might of hastily planned the bike setups…I sure hope that African Twin doesn’t become too heavy to pick up. You will tip over at some point. 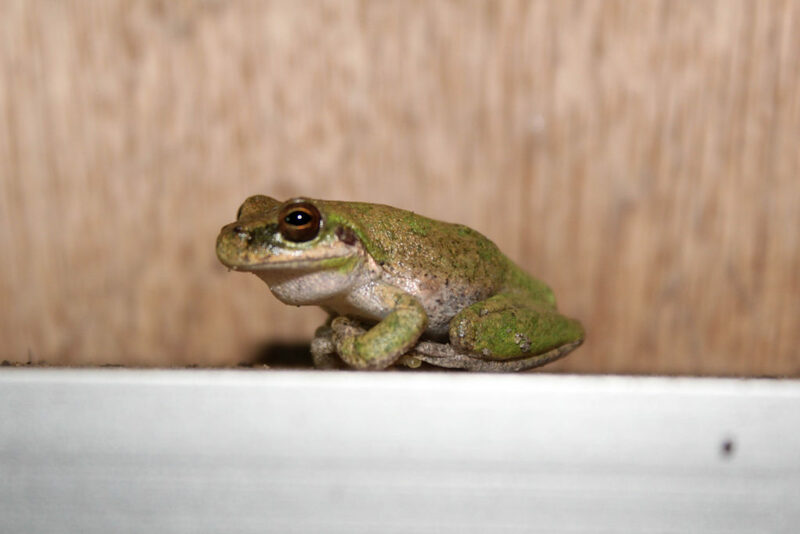 Love the blog and the pics -Keep it up and best of luck.